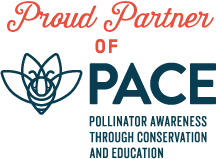 Over the years, our partnership with our good friends at PACE (Pollinator Awareness through Conservation and Education) has proven the perfect pairing of local honey producers and local honey advocates. And this year, we’re teaming up to sweeten your Black Friday like never before. During Black Friday weekend––Friday, November 23rd through Tuesday, November 27th––you’ll get 25% off your purchase of $35 or more from our online store. Now’s your chance to snag the sweetest gift––and deal––of the season. If you’re hosting for the holidays, you can give your out-of-town guests a taste of home with their local varietal or welcome them with local honey from right in your backyard. For our Black Friday special offer, as always, a portion of profits will go to PACE, helping to promote and protect pollinators all around the world. PACE helps maintain habitat gardens to give pollinators a home and educates adults and children around the country on how to protect their local pollinators. Besides honey, pollination is the greatest gift bees give. From large farms to local flora, pollinators are vital to the reproduction of native plants and food sources. In fact, it’s estimated that one out of every three bites of food eaten worldwide is a result of pollinators. In the years to come, pollinators will only need more human help to thrive, and PACE is leading the charge. Our extended Black Friday deal gives back to you and the bees. You get a buzzworthy discount, and they get much-needed help from PACE to keep producing delicious local honey for decades to come. Head over to view our products and shop through the online store and grab the sweetest deal of the season all weekend long.